Season chicken breast with salt, pepper and garlic powder. Cook on Gorge Foreman grill. Once done (3 to 4 minutes) cut into strips or shred. Sauté onions in a separate pan using small dab of organic coconut oil. Clean lettuce and pat dry. 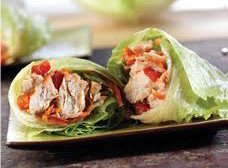 Place chicken breast on lettuce, add onions and tomatoes and wrap. You can add additional shredded lettuce. Prepare your vegetable and fruit servings the day before. Chopped vegetables and fruits can be stored in stainless containers or plastic ziplock bags for ready meals in a rush.